When the weather outside is frightful, what better way to warm up than with four magnificent tales of love and adventure? 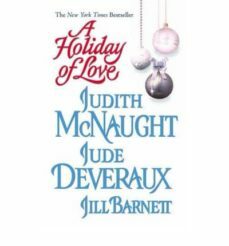 Slip into a bubble bath or curl up in front of a roaring fire--and let "New York Times "bestselling romance authors Jude Deveraux, Judith McNaught, Arnette Lamb, and Jill Barnett whisk you away! In New York City in the late 1800s, a beautiful but clumsy angel turns a lonely man's life around...In medieval Scotland, the intrigues of a Christmas Mass imperil two Highland lovers...In Regency London, a world-weary lord receives an outrageous proposal...In modern-day Colorado, a daring and clever twelve-year-old plays matchmaker for his bighearted but impractical mother... Filled with drama, adventure, and sizzling romance, "A Holiday of Love" will transport you to a world where love always reigns supreme!